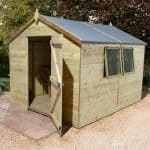 This large apex shed isn’t the cheapest that we review, but it delivers great performance and is made to a very high quality. That’s shown by the use of PAR cladding on all the surfaces, not just the walls. It means that the structure as a whole feels very solid and stable, and so you won’t need to worry about having to reinforce the roof or flooring. The tongue and groove cladding is also very effective at stopping water penetration, as there are no gaps for rain to find its way through. Weather proofing is also provided by the apex roof which is covered by mineral felt, and from which water bounces or runs off. With these weather defences in place we would expect this shed to be highly resistant to rot, especially if annual preservative treatments are maintained. For this reason, we were disappointed to find that there is no warranty provided beyond an initial year. There are six windows that let a good amount of natural light into the shed, so it’s a suitable place to carry out a hobby or even to use as a mini workshop, particularly given the ample headroom although we would have liked the eaves to be a little taller. 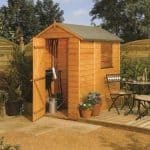 The traditional look of this timber apex shed has a classic appeal that makes it suitable for almost any garden. With a generously proportioned base area you can store a lot of tools and gardening equipment inside, although we can also imagine it being used as a bicycle store or even as a workshop to carry out a hobby or enjoy your leisure time in. We were pleased to see an apex roof at the summit, as this not only channels water away from the interior it also creates extra vertical space to move around in and to store taller goods in. Its peak height is 2.27m, which is more than adequate, but its eaves height is only 1.67m. This means you’ll find much more space to move around in at the centre rather than towards the sides. The overall width of the shed is 2.44m, and the overall depth is 3.66m. 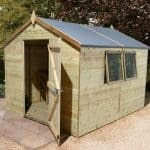 One area in which this shed performs very well is in the cladding and frame, and these are, after all, essential for its durability and solidity. We were pleased to see PAR tongue and groove cladding used, as this planed and high quality material provides extra toughness. In essence, it means that the 12mm PAR cladding performs like 16mm standard cladding. The frame too, at 44 X 27mm was thicker than on many sheds we review and it featured rounded edges at the corners, indicative of its high quality. It was good to see that the same cladding had been used for the floor, rather than more cost effective options such as solid sheet material. We would, however, have expected to see pressure treated floor joists supplied with this shed to give it more protection against surface moisture. With a shed of this price, we would have expected it to have been given a long lasting preservative treatment and for it come with a lengthy extended warranty. Unfortunately, neither of these is the case. A basic dip treatment has been provided, which means that the customer has to treat the shed themselves, with a good quality wood preserver, within six weeks of installing it. This then has to be repeated on an annual basis. Despite the good waterproofing offered by the rain repelling roof and cladding, only a one year warranty is provided against rot, whereas we often see warranties given that last ten or even fifteen years. We were impressed by the fixed windows that are supplied with the shed. The sheer number of them, six, means that the interior is very light and welcoming. They’re made of horticultural glass, a tough form of glazing that is noticeably thicker than that found on many windowed sheds we review. There is also an option to have no windows, for people who need the added security this brings, which we feel is a welcome addition. The door is very accommodating, with a width of 0.76m and a height of 1.75m. These are both more generous dimensions that many single doors we see, and it means that it’s easy to carry bulky or wide objects in and out. For an even wider opening there is the option to change to a stable style door or to upgrade to double doors that have a four foot wide opening. The thing we liked most about the door is that it comes secured with a key operated lock, whereas we often see doors that are supplied without any locking system. In today’s world where shed crime is perceived to be on the rise, this can be very reassuring. In fact, we feel that just the sight of a strong locking system such as this can be enough to deter some break in attempts, especially as the windows too will resist all but concerted attempts to smash them. Moisture in the ground can cause big problems for timber sheds, which is why we always like to see them elevated above ground level. As we mentioned earlier, no joists are included as standard, but a set of floor bearers are available as optional extras for the price of £61.99 and we would highly recommend their purchase. Another option that many customers will find useful is the installation service. 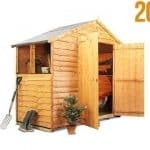 Whilst it is possible to self assemble this shed, although at least two people are needed for the task, we know that many people have neither the time nor confidence to do this. For £109.99, an experienced team will ensure that you have a perfect and frustration free installation. With planed all round cladding used on walls, flooring and roof, and chamfered edges on the frame, it was soon apparent that this was a very high quality garden building. 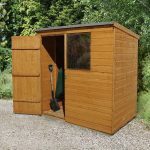 A lot can be fitted inside this shed, making it a versatile structure that can be used for so much more than garden supplies. With so many parts and windows, this can seem a little tricky to install so read the instructions carefully. Two people can expect to take around five hours on the installation, but do allow longer. We have seen cheaper sheds that offer a similar storage capacity, and ones that come with longer warranty periods. Quality wise, however, this is hard to beat. 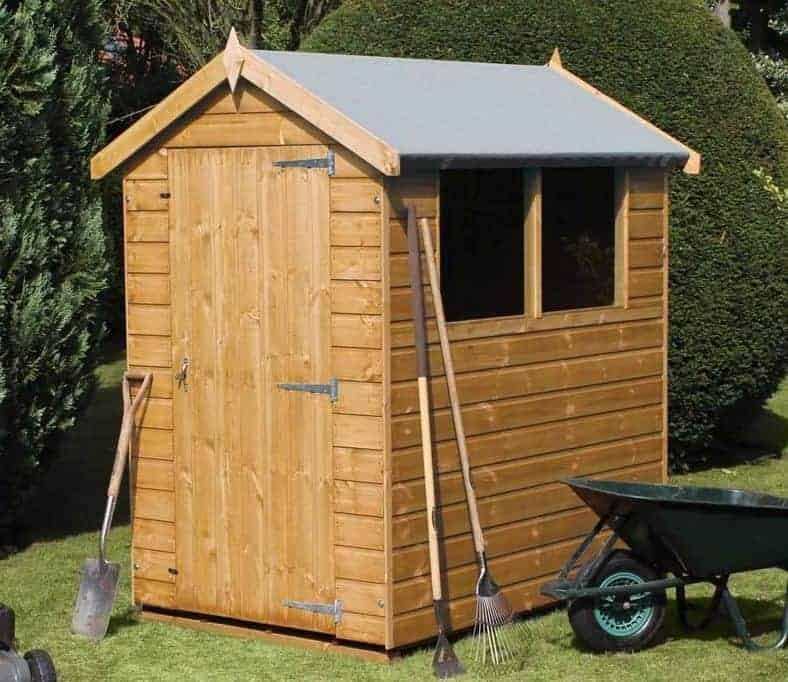 Final Thoughts: We really liked this shed from the moment we saw it assembled, and we can imagine anyone being proud to have it in their garden, but be aware that you will have to pay more than the basic initial price. That’s because adding floor bearers is a must, and you’ll also have to treat it regularly with wood preserver including just six weeks after it has been installed. 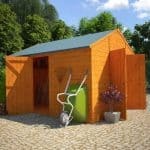 If these extra costs aren’t a problem, then this shed has a lot to recommend it. The six windows make a big difference to interior, and you can also change a fixed window to an open window to give more ventilation if required.